Do you ever have days when you want to bake, but you don't feel like making a big racket in the kitchen? You just want to do it quietly, unaccompanied by the clatter of metal pans and the growl of your mixer? Maybe the kids are still asleep and you're relishing the momentary solitude, the morning's so calm and peaceful you can't stand to break the spell. Well, I know just how you feel. Days like that call for recipes exactly like this one. It's guaranteed not to wake the neighborhood. All you really need for it, once you've measured the ingredients, is two big bowls, a spoon and spatula, a bench scraper or sharp knife, and a good work surface for kneading. That's basically it. Oh, and you'll definitely need your own capable hands because they, my baking friends, are the most critical component. And, thankfully, they're quiet. Now let's talk about the word "rustic" for a minute. The dictionary defines it in a variety of ways. "Characteristic of, or resembling, country people," "made of rough limbs or trees," and my own personal favorite, "lacking in social graces or polish." I think that last one applies pretty safely here without causing offense. After all, this bread is mixed by hand, shaped by hand, and it'll accept a few customizing tweaks without having a high falutin' hissy fit. It knows it's naturally good, and doesn't have to try too hard. You can easily whip up a couple of these loaves without feeling afterward like you've just run a race or been on a bad job interview. You know how some recipes kind of make you feel like that? Where you can just tell, about halfway in, that things are not gonna turn out well? With this bread, you don't have to worry. It won't let you down. So slide your dough into the oven and prepare for happiness. Maybe even full-blown joy! At the very least, expect to experience a sense of peaceful contentment in your bread baking powers. And don't forget to enjoy the quiet while it lasts. Adapted from The Farm Wife blog's formula for "Country White Bread," these loaves can be made panned or unpanned, and will accept modest alterations pretty well. I added in, with the bread flour, a little bit of flax meal, along with a smidgen of wheat bran and wheat germ, to give it a little more character and substance. But I've also made it entirely with white flour, too, and that's a great loaf also. 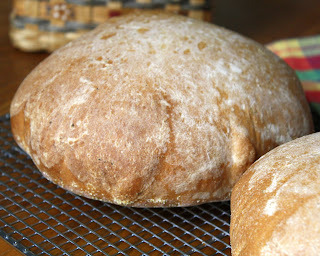 I love bread that doesn't need to bake in a pan, don't you? I baked these on a stone, but you can certainly bake them atop parchment on a baking sheet. 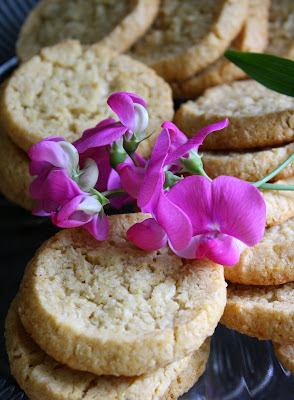 In a large bowl, lightly whisk together the sugar, salt, instant yeast, three cups of the bread flour (only three), the flax meal, wheat bran, and wheat germ. Add the water and milk into this, stirring until very well blended. Add in the butter and eggs, and stir until fully combined. Now, gradually add in about two and one half cups more flour, stirring until the dough looks like a rough shaggy mass that pulls away from the sides of the bowl. Knead the dough until it feels smooth and elastic, working in the final 1/2 cup of flour as you do so; this may take at least five minutes of steady kneading, more or less. Use oil, vegetable spray, or shortening to completely coat the inside of another large bowl. Put your dough into it, turning it over once so it's coated all over. Grease/spray etc. one side of a sheet of plastic wrap and use it to cover the bowl, greased side down. Place the bowl in a warm spot and let the dough rise until it has doubled; that should happen within an hour (mine took barely 40 minutes on a hot day). Press your fist into the risen dough, here and there, a couple of times to deflate it. Turn the deflated dough over in the bowl and cover it again with the greased plastic wrap. Again, let it rise until doubled. And, again, this may take up to an hour depending on how warm your house is. When the dough has doubled, dump it out onto your work surface (only very lightly floured this time) and cut it into two equal parts using your bench scraper or a sharp chef's knife. Shape each of the two halves into a shallow round, making sure to tightly pinch closed any seams. Sprinkle a very thin layer of cornmeal (or you can use a little flour) onto a couple of parchment sheets. Set the dough rounds on the cornmeal. Cover the dough with greased plastic wrap and let them proof (aka have their final rise) until about doubled. This might take half an hour. If you're going to bake the bread on metal baking sheets, preheat the oven to 400 degrees for at least 20 minutes. If you're using a ceramic baking stone, preheat the oven to 475 for at least half an hour so the stone can get really hot, then turn the oven down to 400 immediately upon placing the dough into the oven. If you are using metal sheets, you can just slide the dough, still on its paper, right onto them when you're ready to bake. If you're going to bake on a preheated baking stone, you can still give the dough its final proof on cornmeal over parchment, but then gently move the proofed loaves onto a cornmeal-dusted baker's peel to transfer them to the hot stone (that's what I did). Before putting the dough into the oven, use a little misting bottle of water (or, if no misting bottle, you can do this by wetting your hands and then gently patting the loaves) to moisten the top of the loaves. This will help prevent the loaves from bursting open as they bake. Also, it's a very good idea to squirt misty water quickly into the oven upon placing the dough in there, creating a nice steamy atmosphere (just don't aim right for the oven light). Let the loaves cool on a rack for at least half an hour before slicing. Great for sandwiches, toast, french toast, you name it. Freezes well. Nectarines . 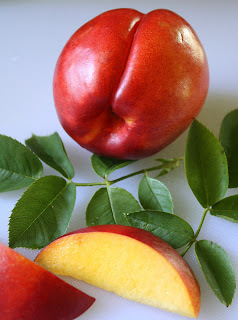 . . really fine, really sweet nectarines. Not something one can necessarily count on finding here in Michigan. Usually, though, that doesn't matter. Why? Because typically, in mid-July, we're wallowing in a surplus of glorious local cherries, baking them into this and stirring them into that, not giving those pretty nectarines from out of state a second thought. But late winter weather played holy havoc with Michigan's cherry orchards this year, leaving us with the most pathetic harvest in decades. Trees that would normally be bending under the weight of crimson fruit look instead as if they've been ever so lightly dotted with red. Just a cherry here, a cherry there. Sorry, folks--forget about "pickin' your own" and keep your fingers crossed for next year. No home-grown cherries? For born and bred Michiganders that scenario is virtually unheard of. So, nothing left to do but rev up the contingency plans. Time to focus on nectarines instead, nectarines that hail inevitably from elsewhere. A sobering thought, no doubt. Miraculously, though, they're incredibly sweet and more than up to snuff. I've been shocked by their quality, thus I've been munching them the last few days with an unbridled sense of righteous privilege, like a koala in a eucalyptus tree. Don't try to stop me. I adapted this from The Grand Central Baking Book, by Piper Davis and Ellen Jackson (I love this book, by the way, and recommend it). 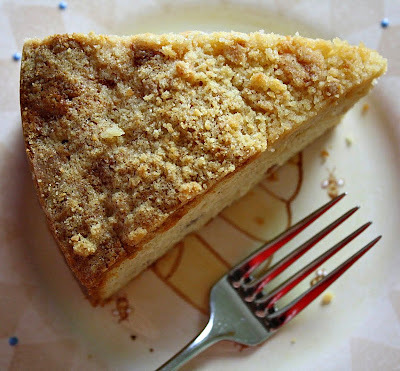 I started with their recipe for a cream cheese apple cake, but made some significant tweaks. First, I reduced the overall size of the recipe by about one third, from one that would produce a large 12" bundt cake down to a reasonably sized 9" round cake made in springform pan. I used a relatively small amount of chopped ripe nectarines, unpeeled, in the batter versus a sizable portion of peeled apples. 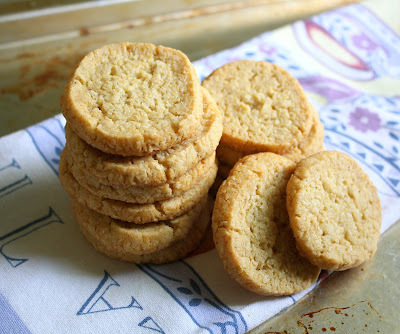 I added in a modest amount of almond flour/meal (if you can't find it in your usual grocery store, check at Trader Joe's, Whole Foods, or health food stores), which lends a subtle richness to the texture without adding any overt almond flavor. I upped the amount of vanilla, in fact using vanilla bean paste instead of extract, and I also fiddled with the proportion of cinnamon. The addition of a streusel topping worked out well, too; I just threw together flour, sugar, almond flour/meal, cold butter, and a pinch of fine sea salt and went at it with a pastry blender. You can count on a cake that happily straddles the fence between a coffee cake and a not-too-dense pound cake. 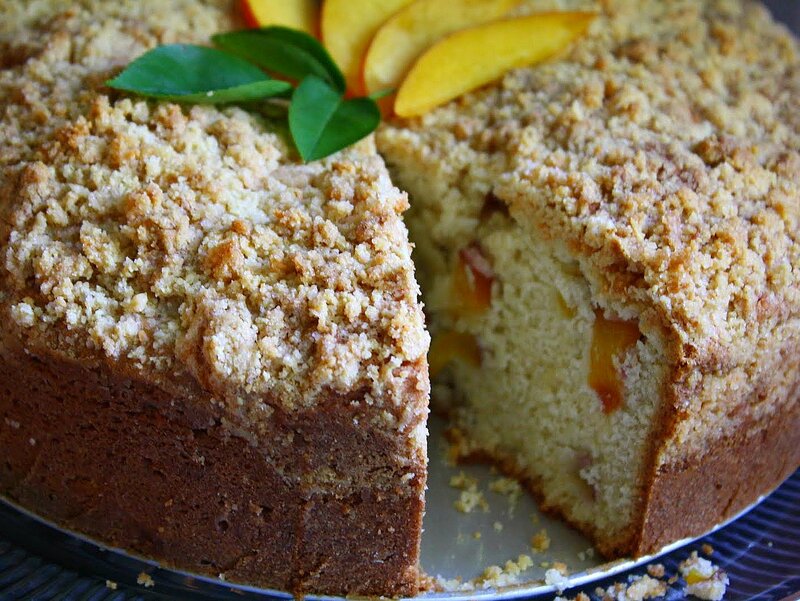 A great cake overall, even without our beloved Michigan cherries. Preheat your oven to 350 degrees. Grease and flour a 9" springform pan. In a medium bowl, whisk together the sugar, almond meal/flour, and all purpose flour. Toss in the butter chunks and combine with a pastry blender or a fork until most of the mixture is in pieces approximately the size of a large pea. Cover the bowl and put it in the fridge. In a medium bowl, lightly whisk together the flour, almond flour/meal, baking powder, salt, and cinnamon. Set aside. In the large bowl of your mixer, using the paddle attachment on medium-high speed, beat together the butter, cream cheese, and sugar until the mixture is fluffy and light in color (beat for at least five minutes and as long as eight). On low speed, add in all of the vanilla, and add the eggs one at a time, beating well after each one. Stop and scrape the bowl and paddle periodically. Still on low speed, add in all of the nectarine pieces, beating just for a few seconds to combine, then add in all of the dry ingredients. Mix only until the flour looks completely incorporated. Scrape all the batter into your greased and floured cake pan. Sprinkle all of the streusel evenly over the top. Bake the cake on the middle rack of the oven for about 55-65 minutes. You'll know it's done when the top is lightly golden, the sides are just beginning to pull away from the pan, the top of the cake doesn't jiggle at all when you move it, and a toothpick inserted in the center come out mostly dry. Check your cake after about 40 minutes and if it appears to be browning too fast, lay a piece of foil loosely over the top. Let the finished cake cool in its pan on a rack for at least 15 minutes, then run a thin knife around the sides, remove the springform carefully, and let the cake finish cooling on the rack. Some things are designed to be sturdy and resilient, to travel well, and to require no special handling. Rucksacks, helmets, and combat boots come to mind. But one doesn't normally associate a cookie with those particular qualities. 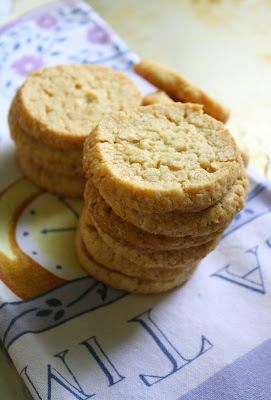 Interesting, then, that just such rough and tumble characteristics rightly belong to this chewy little cookie. Containing no eggs and not prone to crumbling, they hold up well in transit and are palatable for a good while after being baked. Featuring dessicated coconut, oats, and that beautiful concoction Lyle's Golden Syrup, ANZAC cookies/biscuits (they're named for the Australia New Zealand Army Corps) gained popularity during World War I. Wives, moms, and girlfriends prepared them for their loved ones in the service far away. Can't you just picture a tired young soldier unwrappping a parcel from home, only to find a couple dozen of these fragrant cookies snugly packed inside, along with a nice long letter? It's no wonder they've withstood the test of time. And besides boasting a strong constitution, these cookies have a lush buttery flavor. They're just plain delicious. Try one dipped into a cold glass of milk, tucked into a scoop of chocolate ice cream, or served alongside a bright bowl of fruit sorbet. 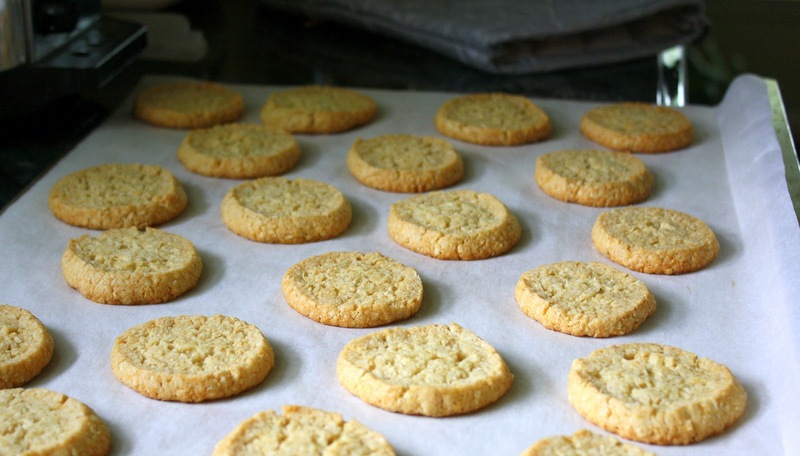 From Alice Medrich's irresistible book, Chewy Gooey Crispy Crunchy Melt-In-Your-Mouth Cookies, this is my formula of choice for this legendary cookie. (My only adaptions were to double the recipe and rewrite the instructions to reflect what I actually did). I doubt this recipe could be improved upon. It's so good as it is. You can always trust Alice's recipes. That gal really knows her stuff. In the large bowl of your food processor, pulse the oats for a few seconds, until coarsely ground but not powdery. In a large mixing bowl, by hand, combine the ground oats along with the flour, cream of tartar, baking soda, and salt. Set aside. In a large pot (I used a dutch oven) set over low heat, stir together the butter, sugar, water, and golden syrup until the butter is melted. Add in all of the dry ingredients, and stir until it's entirely combined. Divide the dough into four equal parts and form each one into a log about 2 inches in diameter. Roll each log snugly in parchment paper and chill in the refrigerator for a couple of hours, or overnight. When you're ready to bake the cookies, preheat your oven to 325 degrees. Line a couple of cookie sheets with parchment. Removing one chilled log from the fridge at a time, slice the cookies to a thickness of no more than 1/2 an inch with a very sharp knife; if the dough crumbles on the edges as you slice, press it back together with your fingers. 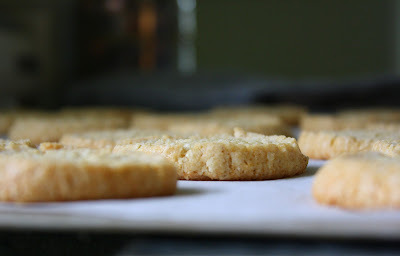 Lay the cookies about 1 inch apart on the parchment lined cookie sheets.